You can save yourself some money – and time as well – when you reserve airport parking at Glasgow Prestwick International Airport (airport code PIK) in advance. There are two Prestwick airport parking lots to choose from. “Watson’s Ayr Park” is an off-airport lot, but the lot features a transfer shuttle service to get you to and from the terminal. “Prestwick Car Park 7” is an on-airport lot, but this one does not have a shuttle service – it is only a short walk from the lot to the terminal. Stop rushing around on travel days to get out the door early enough so that there is time to drive in aimless circles through the airport parking lot, hoping you will find that one last available space on a busy holiday weekend. Instead, book a spot in advance with Glasgow Prestwick airport parking and ease into your travel day. Booking in advance means you can just drive up to the lot at the appointed time, drop off your car and be on your way to the terminal in no time. It is a great way to eliminate some of the stress that comes with travel – and what is more, by reserving ahead you can save money over the drive-in rate at the lot. Glasgow Prestwick International Airport is nearly 30 miles from Glasgow, and actually north of the town of Prestwick. Despite Prestwick’s distance from Glasgow (and the fact that Glasgow has another international airport), it is a popular hub of some European budget airlines. 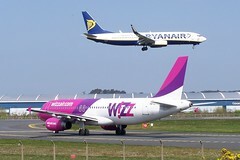 Ryanair uses Prestwick as a hub airport, and has the busiest schedule at the airport. In addition to the passenger flights operated from Prestwick, the airport also operates a large number of cargo flights. Prestwick is also the largest commercial airfield in Scotland. For traffic information, see the resources here. Taxi: Ayr Black Taxis (ABT) is the official taxi partner of the airport, and the pick up/drop off area is in the car park closest to the terminal. Rail: Prestwick has its own rail station (Glasgow Prestwick Airport Railway Station) which is connected to the terminal by a covered skybridge. The journey between central Glasgow and the airport is roughly 50 minutes. Bus/Shuttle: There are Stagecoach Western X77 Express Service coaches which connect Prestwick with central Glasgow. The trip takes roughly 50 minutes.